The Great Mulch Debate: Which is the Best to Use? Traditionally, it was common for gardeners to use Cypress mulch for their flower beds, as it was a by-product of the lumber industry. When the Cypress trees were being cut down for the sole purpose of mulch, however, more attention was focused on better alternatives. Additionally, Cypress mulch doesn’t break down well and develop nutrient-rich soil that trees and flowers need. So, what’s the best type of mulch out there to use? First, let’s go over the benefits to mulching. Spreading mulch over garden soil is an excellent way to save time and money, and it’s a step that should not be skipped over. The purpose of mulching is to help the soil hold moisture, suppress weeds and develop nutrients. Mulch is placed around flower beds, vegetable gardens and tree trunks. 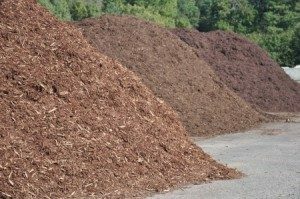 Below are the various types of mulch that are available. Which is the best for your landscape? Wood chips and bark mulch are some of the most common and least expensive mulch varieties. They are an excellent choice for sloped areas because they break down slowly, and this means you won’t have to mulch as often, either. With many options available, you can find environmentally friendly bark options as well. Purchase bags of shredded bark from your local nursery, or a tree care company may be able to sell you the bark or chips at a reasonable price. Pine needles are also great for sloped areas because they hold in place well and break down slowly. Pine needles are thin and delicate, and they allow water to pass through efficiently. Some say that heavy use of pine needles can make the soil acidity, while others debunk this claim. Either way, you’ll find that pine needle mulch is great for azaleas and conifers. Have leftover grass clippings in the summer? Use them as mulch, as they break down fast and add nitrogen to the soil. To avoid the possibility that the grass will rot, apply thin layers of grass around vegetable gardens and tree trunks, or wait until the grass is completely dry. Also avoid using grass that has been chemically treated. Another budget-friendly option that you can find right in your own backyard is leaves. Many people are able to repurpose fallen leaves in autumn for winter mulch. Leaves do break down quickly, and they should be shredded before using them as mulch. If grass clippings and leaves break down too fast for your needs, try straw that leaves behind a beautiful golden color. Straw retains soil moisture, prevents weed growth and adds organic matter to the soil. The biggest thing to watch for is that the hay doesn’t contain any weeds or seeds, otherwise, it’s a stress-free option. If you make your own compost, you’re in for a treat. Compost is an excellent alternative to traditional mulch, and it enriches soils and keeps plants happy and healthy. It’s possible that your compost may be too dry, so you may find that spreading a thin layer of compost followed by a layer of leaves will be best. Compost breaks down quickly, but it sends nutrients to the soil almost immediately. Cocoa hull mulch has a beautiful texture and color and spreads a light chocolate fragrance, hence its name. Cocoa hull decomposes slowly, and it won’t fade as other types of mulch will. The downside is that the mulch is costly, and that’s why gardeners who do apply it do so sparingly. Additionally, cocoa mulch is poisonous to both dogs and cats, something to consider if you have pets. When choosing the best type of mulch for your landscape, consider the cost and effectiveness of the mulch, especially if you have soil that is acidic. And, if you ever need a quick mulch refresh, consider things that you can find in your own backyard, such as compost, shredded leaves or grass clippings.